Our first bike was a beautiful, stock, metal flake blue Schwinn Sting-Ray coaster with matching grips and a white banana seat. We had friends who had Apple and Orange Krates and we longed for the accessories (especially the gear shifter with the big 5 on it). Since we already had the bike, we talked our dad into helping us upgrade. By the time we were finished customizing, the bike had curled out bars, a monster sissy bar, and a shock up front. It was dope. And we’re still bummed that by the time we turned 13 we’d painted it black and turned it into a BMX bike. But there is hope. Schwinn, a zombie company alive today in name only, announced that they are re-releaseing a limited edition of 500 Lemon Peeler bikes. “The Schwinn Lemon Peeler is one of the most recognized Schwinn bikes,” said Milissa Rick, Schwinn Senior Director of Marketing. “We’re excited to make this bike available to those who always wanted to own a Schwinn Sting Ray. This is an opportunity for us to also share our story with a new audience.” . . . 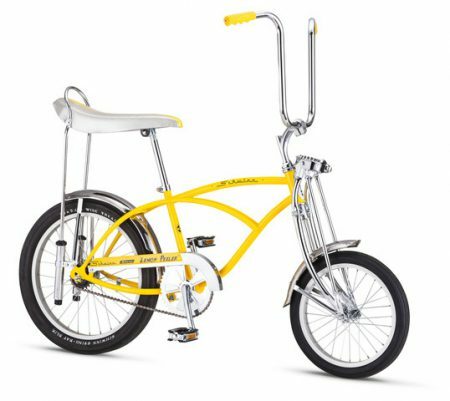 The limited edition Lemon Peeler will feature a spring suspension fork, a Schwinn 16-inch front wheel and a 20-inch Sting-Ray Slik rear tire just like its original counterpart. Additionally, the bike is equipped with a striped banana seat, fenders and a coaster brake. Owning a re-release is not the same as owning a classic, but damn, it looks good. Doesn’t it? The Schwinn Lemon Peeler will reportedly be available from Amazon.com soon for $349.99. We’re kind of hoping if this goes well that they will release some other colors (and five speeds), as well. Follow the jump for the official word from Schwinn. The old Gorge Roubaix has been magically transformed into the 2017 Oregon Gravel Grinder Series and will include races in The Dalles, Bend, and Mr. Hood. Each event, which kicks off April 2, 2017 in The Dalles, Oregon, will feature at least two distances to choose from. We have selected the most scenic, challenging, and quality roads to be found in the state of Oregon. Many are iconic and are included as part of Oregon Scenic Bikeways. These are signature roads that are unique and that you will find no were else. Each ride comes complete with chip timing that allows for immediate results posted onsite and online as well as interim timing points and competitions along the way. Well stocked aid stations, porta potties and well signed courses mean that you can focus completely on the task of finishing strong. Each has a post event party were riders can bask in their accomplishment and trade stories with friends and fellow riders of their experience along the way. For all the details, please follow the jump, or click here to register. Sockguy just rolled out their Spring 2017 line of ankle art and it looks like there’s something for everyone — including Amanda Panda fans. Click the link for all the details. It’s never too early to start planning for summer shred missions? 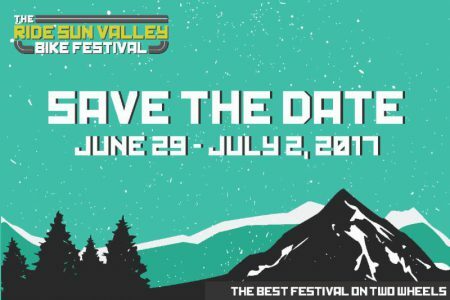 Here’s a great reason to visit the historic Sun Valley, Idaho: seventh annual Ride Sun Valley Bike Festival June 29 – July 2, 2017. Visitors can participate or spectate in one of the many fast-paced races—or kick-back, saddle up and enjoy the summertime recreational offerings of iconic Sun Valley, ID. The four-day festival is host to endurance, skill and learning based events centralized around all things cycling. Live music, bike clinics, demos, shuttle rides and the SCOTT Enduro Cup presented by Vittoria are waiting for you at this year’s eventful weekend, happening June 29 to July 2, 2017. For all the details, click the link. For 2017 Garmin and turned up their team sponsorship and now officially sponsors five world tour teams and four mountain biking teams. Which teams exactly? Here you go: Cannondale-Drapac Pro, Movistar, Astana Pro Team, FDJ Pro Team and Team Dimension Data for Qhubeka. On the mountain bike side they’ve got Trek Factory Racing, CLIF Pro Team, CUBE Action Team, and Scott-SRAM. Garmin will be outfitting the teams with Edge cycling computers, Varia radar-equipped tail lights, plus Forerunner and Fenix GPS smartwatches all around. Kind of makes us want to get on a world pro team, you know, for the smart watches. . . right? For the official word from Garmin, please follow the jump. Pelotonia, a grassroots organization that raises money to fund cancer research through cycling, opened registration for their three-day Columbus, Ohio experience of cycling, entertainment and volunteerism, on February 8, 2017. The event, takes place Aug. 4-6, 2017 and there is still time to sign up and raise money. If you’re looking for a good cause to ride for in Ohio, in August, then this just might be what you’re looking for. For all the official details, please follow the jump. Emerald Expositions, the parent company of the Interbike and Outdoor Retailer shows, had a teleconference with Utah’s Governor Herbert today and based on that call they will no longer be including Utah in any of their future show business.